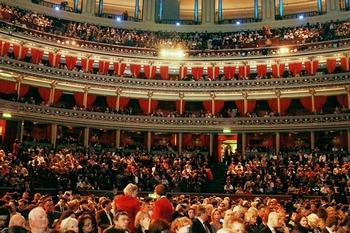 On the evening of June 5, the "Three Super Stars in Collaboration: East Meets West" concert was held at the Royal Albert Hall in London. 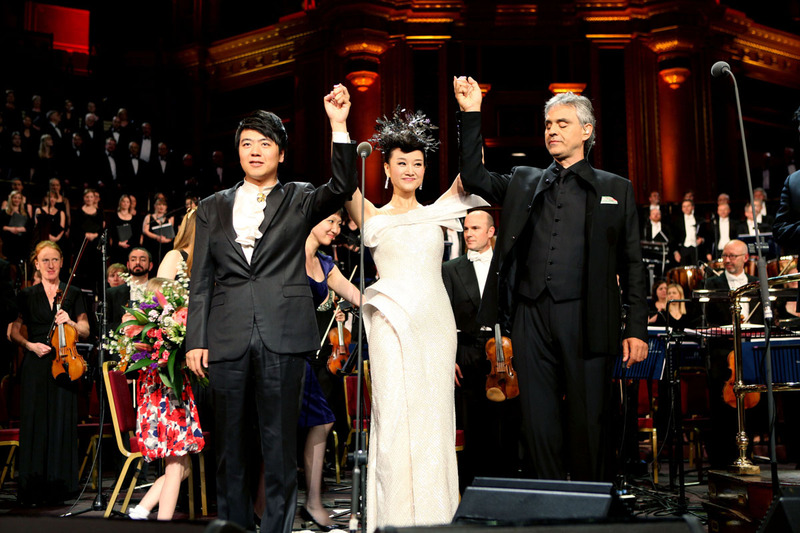 The well-known Chinese singer Song Zuying, the world renowned piano prince Lang Lang and the world-class Italian tenor Andrea Bocelli presented a concert that impressed the world. The concert was accompanied by the British Royal Philharmonic Orchestra. Its choral part was performed by the British Royal Philharmonic Choir and the Royal Choral Society. 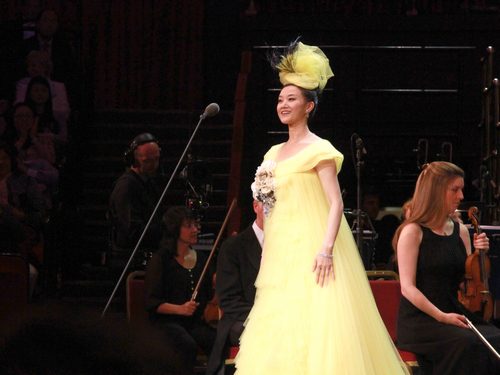 The concert was directed by famous conductor Yu Long and presided over by Yang Lan. 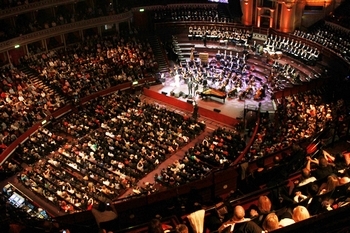 At the invitation of the Chinese Ambassador Liu Xiaoming and Madame Hu Pinghua, Prince Andrew, the Duke of York, some members of the Parliament, the business community and the academic circle as well as foreign envoys in Britain watched the concert together with the over 6,000 spectators. 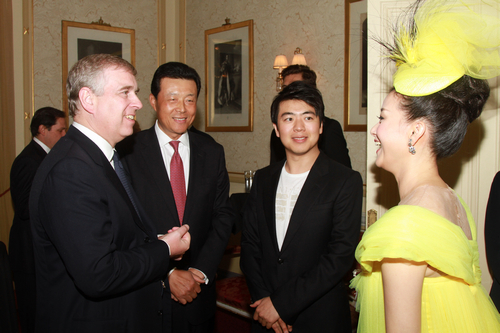 Prince Andrew met and talked with Song Zuying and other Chinese performers and staff members before the performance. In addition to her well known songs the "Spicy Girls", the "Dragon Boat Melody", the "Good Days" and the "Flying Song", Ms. Song also made a debut of her new song "Guan Ju", of which the lyrics are from the Book of Odes and Hymns. Ms. Song cooperated with Lang Lang in performing "You and Me", the theme song of the opening ceremony of the Beijing Olympics to give good wishes to the upcoming London Olympics. She also performed the "Love Song of Kang Ding" and other songs together with the famous Italian tenor Andrea Bocelli. 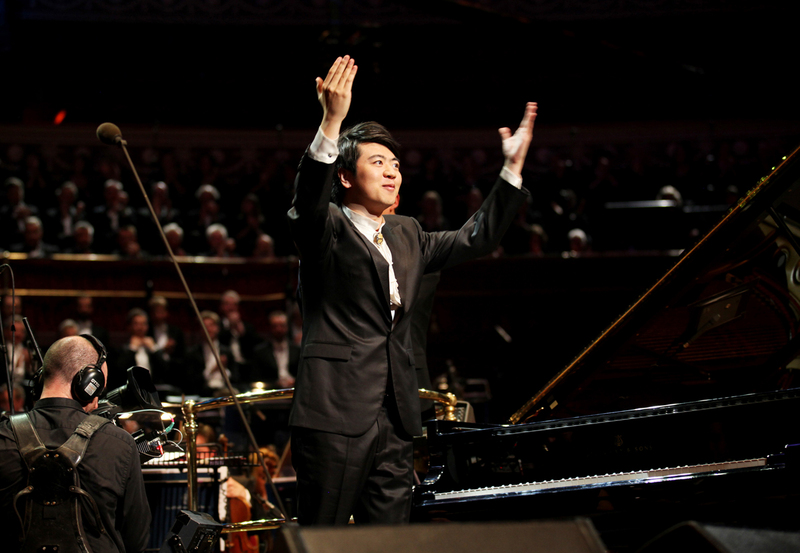 The well-known pianist Lang Lang performed the Andante Spianato and Grand Polonaise of Chopin. The chorus of 180 singers formed by the British Royal Philharmonic Choir and the Royal Choral Society provided vocal accompaniment in Chinese for Song Zuying. They also sang a cappella in Chinese the "In That Distant Place" and the "Jasmine". Song Zuying's "I Love You China" pushed the concert to a height. The accurate accompaniment in Chinese of the chorus and the passionate performance of Ms. Song impressed the audience, especially the Chinese ones. 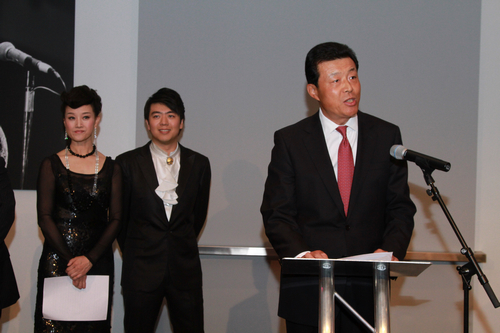 Ambassador Liu delivered a speech at the reception after the concert and expressed his wonderful view on the event. He said that the concert was a "wonderful concert" at a "wonderful time" and in a "wonderful place". On the occasion of the forty years of China-UK full diplomatic relations, the Queen's Diamond Jubilee celebrations and the upcoming opening ceremony of the London Olympic Games, the three artists with extraordinary achievements in the own fields presented this music feast. This is not only a high-end artistic collaboration, but also an unforgettable event in the history of China-UK cultural exchange. Jasper Hope, CEO of the Royal Albert Hall, presented a souvenir to Song Zuying on behalf of the Hall, and Ms. Song presented a Miao ethnic silver ornament in return. Xu Peidong, Vice Chairman of China Federation of Literary and Art Circles, Chairman of the Chinese Musicians Association and famous songwriter, and Zeng Qinghuai, Vice President of the Chinese Culture Association, also gave warm speeches at the reception. The event was co-hosted by the Chinese Olympic Committee, the Chinese Musicians Association, the Chinese Embassy in the UK and the Beijing Olympic City Development Association.